Original headline: “Here I Am, Taking My Own Picture,” from February 2006. Planting a flag: No, Paris Hilton, you did not invent the selfie. I know you claimed as much this past November, when you tweeted a couple shots of yourself and Britney Spears from 2006, along with the caption, “11 years ago today, Me & Britney invented the selfie!” I did not invent the selfie either, but I did write a Sunday Styles cover story on the topic nine months before you and Britney said cheese. As far as I can tell, that article was the first in-depth journalistic look at the emergent phenomenon of the quickie digital self-portraiture. That accomplishment might have earned me first-ballot entry to the Trend Reporter’s Hall of Fame if I just had the good sense to appropriate the term “selfie.” Oh well. In journalistic terms, it counts as a muted victory, like driving home the winning run of the World Series with a bunt. The term itself: Credit for the first documented use of the term selfie typically goes to an Australian man who used it in an ABC Science Online forum in 2002 to describe a shot of the bloody lip he sustained after a drunken face-plant: “Sorry about the focus, it was a selfie.” The term may or may not have been big in Australia, but it was still unfamiliar enough on these shores even four years later that none of my one to two dozen sources for the story, many of them young digital natives, ever invoked it. It was not until 2012 that the term “really hit the big time,” according to Time, which included selfie in its top 10 buzzwords of the year. 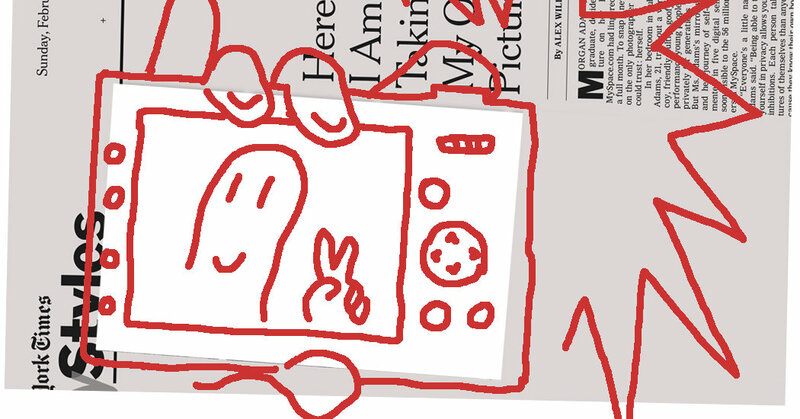 Flip phones and webcams: It may seem primitive by the standards of this Instagram-mad era, but the boom in digital photography in the mid-aughts was actually pretty groundbreaking from a cultural perspective. The century-plus dominance of film photography, with its hassle and expense, had ended just a few years earlier. The rise of cheap digital point-and-shoot cameras, webcam-enabled laptops and camera-enabled flip phones meant that, for the first time in history, people could carry a camera pretty much anywhere and snap pictures of anything. For free! (Kind of.) Given that this technological shift happened just as members of the millennial generation, soon to become famous for broadcasting their lives online, were taking the stage, we can hardly be surprised that the kids turned the camera on themselves. But was this new? It was, according to photography historians. Those digital self-portraits soon to be known as selfies represented nothing less than “a new genre of photography,” Guy Stricherz, the author of “Americans in Kodachrome, 1945-65,” said. He should know. For that book, Mr. Stricherz spent 17 years thumbing through more than 100,000 slides gathered from midcentury American families, yet found fewer than 100 self-portraits. By 2006, you could find that many scrolling through a few dozen MySpace pages. MySpace, my face: And make no mistake, MySpace was the breeding ground for the selfie as we know it today. In that relative Bronze Age for social media, before Facebook went mass, the colorful, teen-friendly platform was a sensation. It grew so fast that, for a hot second, it seemed like it might swallow the youth culture whole. (In April of 2005, this shooting-star platform actually passed Google in the number of monthly page views, according to one web analytics company at the time). “This is the idea that adolescents think people are more interested in them than they actually are, that people are always looking at them and taking note of what they are doing, even if it is just walking across the school cafeteria,” said Jeffrey Jensen Arnett, a developmental psychologist. How cool it was, then, when the imaginary audience becomes real. The selfie goes mass: MySpace may have failed to swallow the culture whole, but selfies basically did. Within a few years of the article, virtually everyone was armed with a smartphone featuring a switch-camera icon that flipped the camera lends toward the user. The shots they took found an audience on look-at-me social media platforms. Tourist meccas, from like the Eiffel Tower to the Great Wall of China, became virtual forests of selfie sticks. Astronauts on spacewalks snapped selfies. Even animals couldn’t resist, BuzzFeed noted. The selfie even ascended to celebrity A-list at the Oscars, thanks to Ellen DeGeneres’s memorable group mug a few years ago. And the selfie snapped by a 13-year-old boy during Justin Timberlake’s halftime performance may be the only thing that non-Eagles fans remember about the most recent Super Bowl. Is the selfie a blight on the cultural landscape or a new form of folk art? At least one institution seems to think the latter. The Museum of Selfies is set to open for a limited run this spring in Glendale, Calif., exploring “the history and cultural phenomenon of the selfie — an image of oneself taken by oneself — with roots dating back 40,000 years.” Wait, 40,000 years? Are you convinced now, Paris?